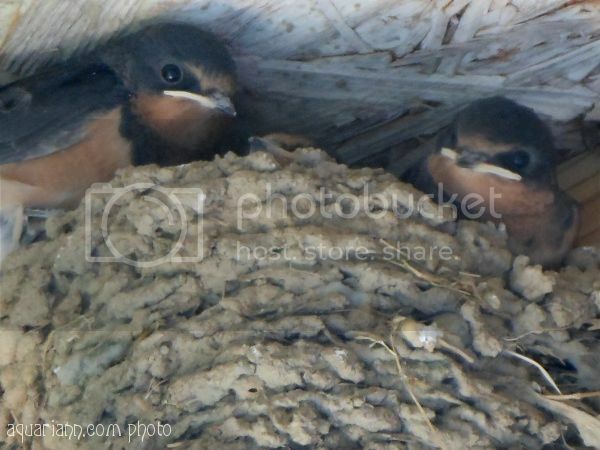 Remember the barn swallow nest I photographed last year? Another swallow family built one just a few feet away under the same staircase this year. The nest is so high up that my camera couldn't spy the baby birds until they were almost big enough to try to fly - now they're soaring all over the place! Oh such cute little birdies. I am surprised at this capture. WoW! Awww, reminds me of that bird that flew out of husband's car last Saturday. Good thing it didn't fry in the hood under the Texas sun. Wow! That is wonderful Kristin! You got such a lovely shot. Thanks for hosting. That's a great capture. Their nests are so greatly made! Wow, how could you take this awesome photo! It´s very unique! They're so cute! Great shot!! Awesome shot! They are so cute! We have a bird that built a nest right outside my door in a planter box. Scares the beejeezus out of me when I open the door and it zooms past lol. Awhhh...they are so cute, we once had a family of Robins build a nest under our sdck. Aw, how sweet! Looks like cramped quarters now that have grown. They are so sweet. Quite nestled in there. How did you manage to take the photo without startling them? Looks like you were right in there with them. :) Have a wonderful WW! How awesome! That is a sweet photo! Awww! What a sweet capture! Great shot. I love nature pictures. Great shot!! They are adorable! Oh dear, that sounds awful! This is only the second year they've appeared - I hope my boss doesn't have to deal with a swarm in the years to come. aawww....how cute they are! They must be awesome to watch! Gorgeous photo. Happy WW, thanks for linking up at Mystery Case. Have a great week. There is nothing better than capturing those pics. I have enjoyed watching all the birds we have in our backyard, including a family of ducks and quail!! Thanks for stopping by Oh My Heartsie this week! I swear there is a nest just outside of my bedroom window. Fantastic shot! They made me smile!! Wonderful quote with an important message that we should all take very, VERY seriously! Great capture too! We had robins on our porch for a few years, but they haven't come back for the last two. We are quite bummed about it.